"In the heyday of kings, a mysterious force swept over all of the kingdoms possessing the rich, powerful and wealthy causing a Blackout- Forcing the kings to rule their kingdoms blindly. The poor, however, were not affected by this mysterious force. The wealthy and powerful had no choice but to become united with the poor against this force to save their kingdom." "Some people believe that the mysterious force was the eyes of the Demon but others believe that it was the watchful eyes of the Gods." The inspiration for the design is this legend, about the alliance between rich and poor people against a mysterious force to save their kingdom. 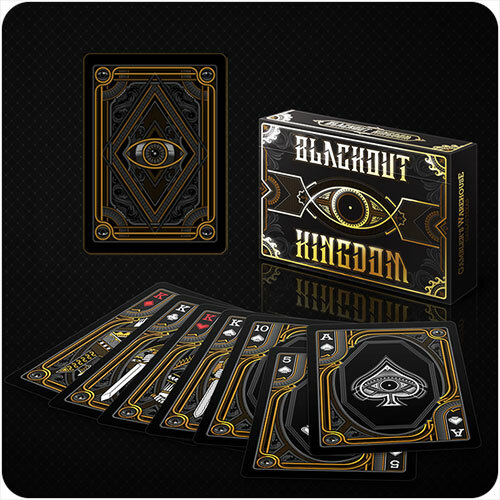 The deck contains the essence of a story like this, with dark cards, black and white and with customized court cards showing blind royal characters under the influence of that mysterious force. The cards are strong and eerie, transmitting the atmosphere of the story behind the deck. Αυτό το προϊόν προστέθηκε στον κατάλογό μας την Tuesday 14 April, 2015.